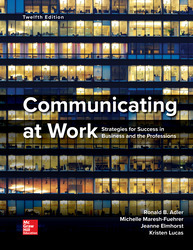 Communicating at Work provides students with strategies that are rooted in current research and real-world best practices. With Communicating at Work, students will gain the tools they need to make informed and ethical decisions in face-to-face and virtual environments and to master practical skills and competencies necessary for succeeding and maintaining balance in today's business world. Updates throughout the twelfth edition reflect the rapidly changing landscape of professional communication influenced by the visibility and connectedness of the mobile revolution. What Makes a Group a Team?